Palio is an Italian word that describes a contest in which different groups, such as factions or neighborhoods of a town or city, compete against each other in contests. 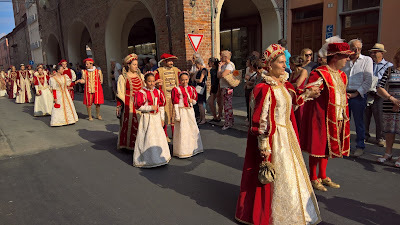 Palios are usually based on an historical event, which is reflected in the participants wearing costumes and playing roles over a series of days of celebration and ceremony leading up to the palio. The winning group walks away with money and bragging rights for being the best of the bunch, at least for one year. Chances are you’ve probably heard of the Palio di Siena. But, can you name another palio? You probably couldn’t off the top of your head despite there being over 50 palios a year in Italy. 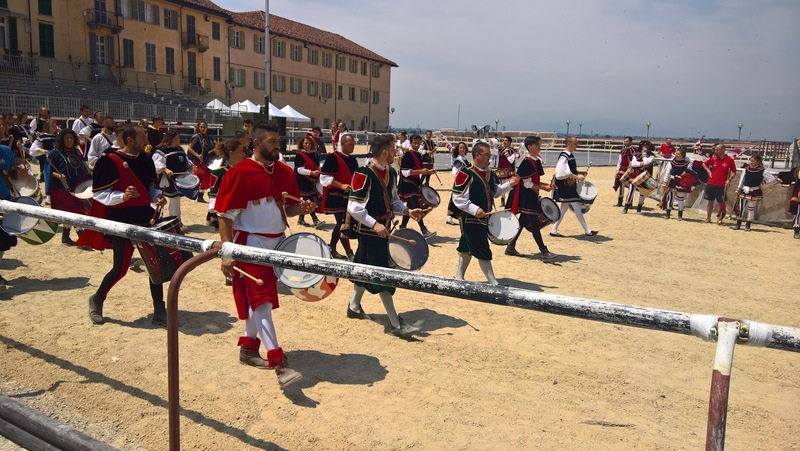 Don’t feel bad, we couldn’t either, at least until recently when we had the chance to experience the Palio dei Borghi e Giostra dell’Oca, or simply put, the Palio of Fossano where seven borghi compete on the second to the last weekend in June. 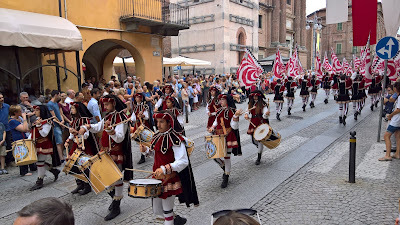 Left: The procession of Borgo San Bernardo in the borgo's colors red and white as they head to the palio. 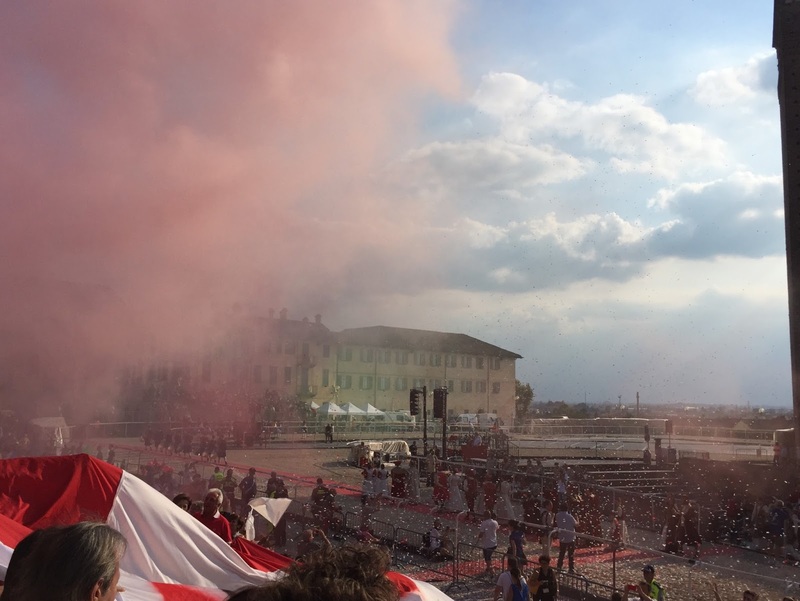 Center: Borgo San Bernardo fans cheering with smoke and confetti. Right: The castle of Fossano: Castello dei Principi d’Acaja. Fossano is a charming Piedmontese town of about 25,000 people. It is considered one of the seven sister cities (sette sorelle) that are the most important in the Province of Cuneo. The sisters cities are Cuneo, Alba, Bra, Fossano, Mondovì, Savigliano, and Saluzzo. 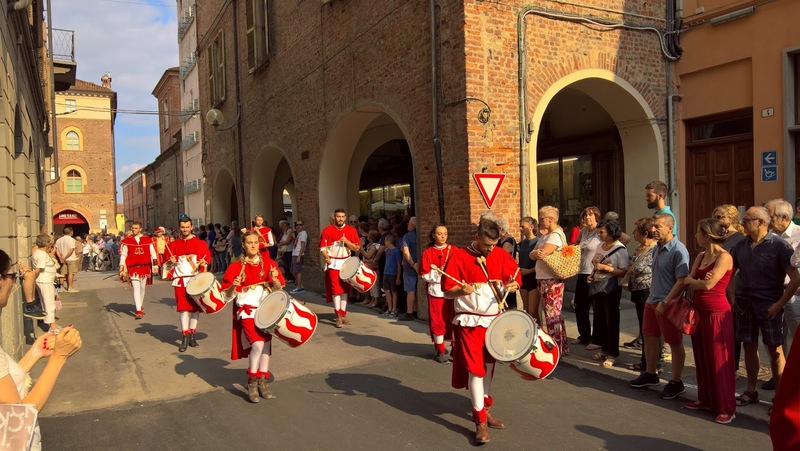 The beautiful and compact centro storico of Fossano is the stage where several days of celebration lead up to the day of the palio. On that day, costumed representatives from each borgo make their way to the castle in an elegant and colorful parade called the sfilata del corteo dei borghi. 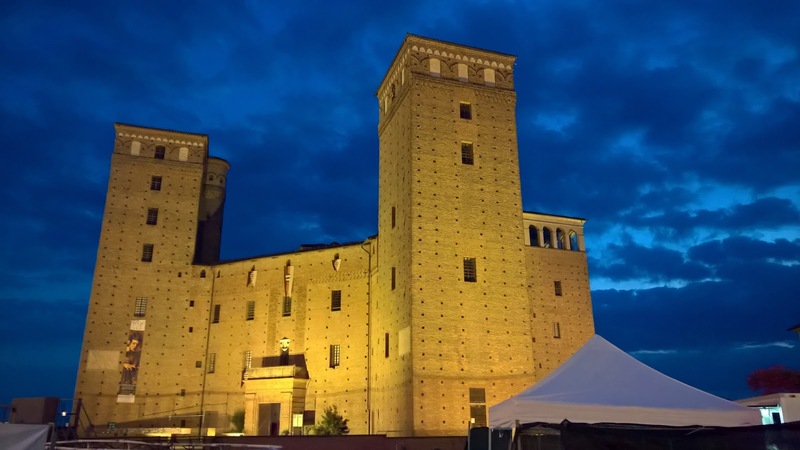 Fossano’s castle, Il Castello dei Principi d'Acaja, is one of the most picturesque to be seen and provides the perfect backdrop for the palio. 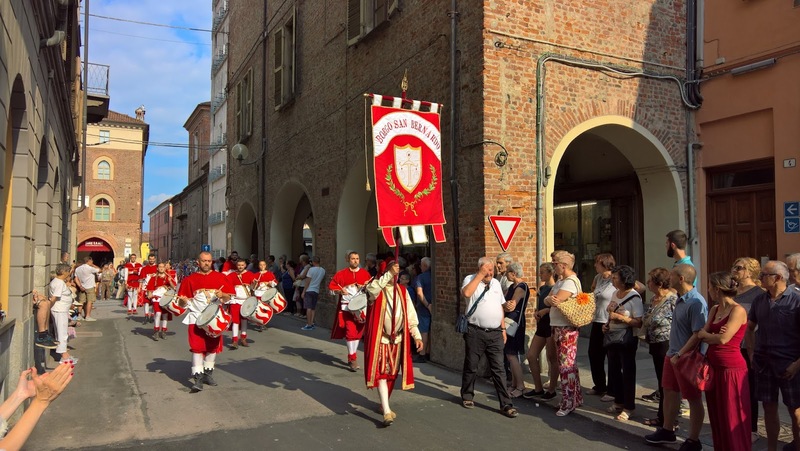 We had been to Fossano three times before, including visits to the castle, but this time it was really special with the palio and its festive environment. It was amazing to see the area around the castle transformed into a horse racing circuit with viewing stands. It was all well-laid-out well-planned. 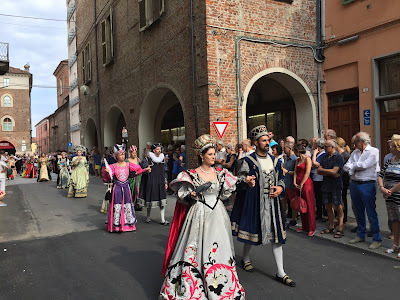 I guess Fossano has had some time to perfect their palio: the first was held in 1585 when Charles Emmanuel I, Duke of Savoy passed through Fossano with his new bride Infanta Catherine Michelle of Spain. The couple was married in March 1585 in Spain, and they were making their way to Turin, the capital of the Savoy dynasty when they dropped in on Fossano. 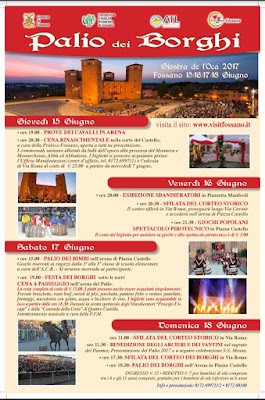 According to the Palio dei borghi site, the royal couple was treated to celebrations including fireworks. From that royal visit over 400 years ago, the palio of Fossano was born. 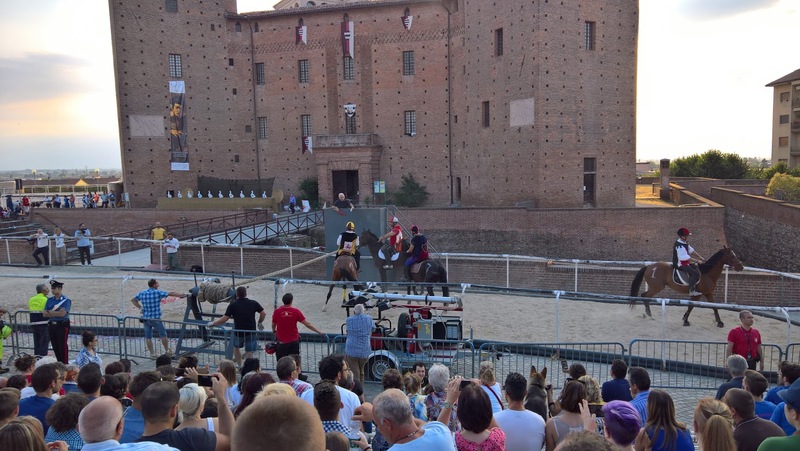 The Fossano’s palio involves two competitions: archery and horse racing. In the archery contest, archers (arcieri) from each borgo take aim at (fake) geese (oca/oche) on a moving track, trying to hit as many as possible. Each borgo provides three archers who shoot six arrows a piece for a total of 18 attempts. The three highest scoring borghi in the archery contest compete in the first horse race or heat (batteria), while the remaining four borghi compete in the second race. A third horse race is for the winners of the first two races. To be honest, I didn’t completely follow how the point system worked. In fact, in this palio it got a little complicated as the archers were called back as a tie-breaker (spareggio) to settle the final placement of the borghi. The rules call for another horse race as a tie-breaker, but there was limited light and the archers therefore settled the question. In the Palio di Fossano, the horses are ridden by professional jockeys (fantini). As you can imagine, good jockeys are in high demand there being so many palios across Italy. The jockeys wear a tunic (casacca) with the colors of the borgo they are riding for, but are not from the borgo (or it would be the rare case that they were). It’s the work of the organizers in each borgo to procure the best jockey and horse they can. Left: The king and queen of Borgo San Bernardo head to the palio. Center: Borgo San Bernardo standard bearer and drummers. 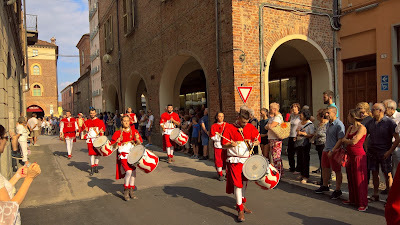 Right: Earlier in the day of the palio the Borgo San Bernardo musicians practice at Castello dei Principi d’Acaja. A borgo is part of Italian city or town like a neighborhood, district, or hamlet that has some importance such as being a center of commerce, containing an important market or fortification, or having some other distinguishing feature. In Fossano, there are seven borghi: Borgo Vecchio, Borgo Salice, Borgo Piazza, Borgo S. Antonio, Borgo San Bernardo, Borgo Nuovo, Borgo Romanisio. The statistics provided by the Fossano comune site suggest that each borgo is between 1,000 and 6,000 residents (Romanisio was not included in the data). Stats on number of residents of six borghi in Fossano. Source. Borgo Vecchio’s colors are red and black, and their symbol is a pair of fish (Pisces). Borgo Vecchio was the winner of the Palio di Fosssano 2017. They hadn’t won in 52 years so it was a sweet victory for them. Borgo Salice colors are blue and white, and their symbol is a scorpion (Scorpio). They seemed to be the least “liked” borgo. When I asked why this was the case, I was told they were arrogant, but mind you, it’s a small town and there is no real animosity that I sensed. In fact, there was an amazing amount of camaraderie within and between borghi. 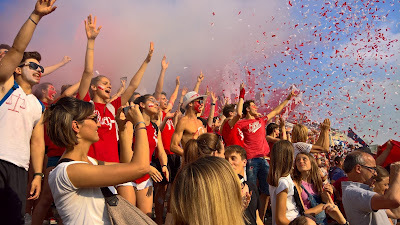 The palio is time for coming together and having fun while celebrating history. Borgo San Bernardo’s colors are red and white, and their symbol is a balance (Libra). We were rooting for Borgo San Bernardo, which was the borgo of our hosts. Borgo San Bernardo by virtue of its name also has the San Bernard dog as a mascot. 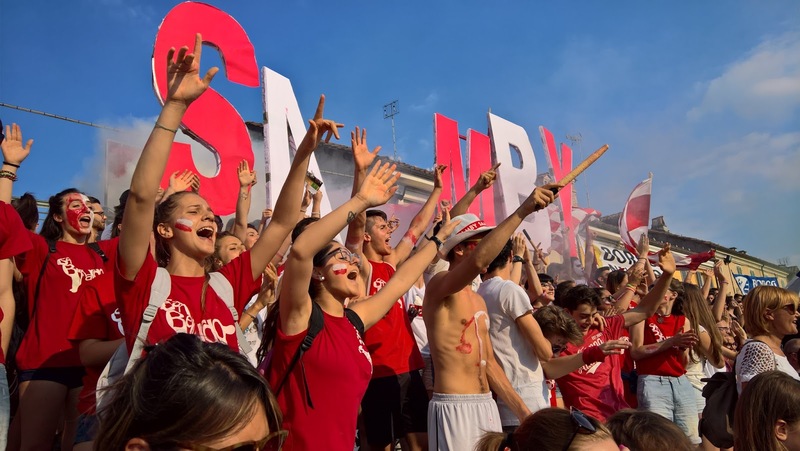 We saw many red and white t-shirts with pictures of San Bernard dogs, and during the palio, letters spelling SAMBY – referring to the cute stuffed San Bernard – were held up in the cheering section as can be seen in one of the photos. If Borgo Salice was the least “liked”, Borgo San Bernardo has to be the borgo that other teams poked the most fun at this year. That's because last year, San Bernardo won the palio, sort of, until they had the title revoked because of horse doping. Other borghi held up signs referring to the doping incident as can be seen in one of the photos. The story goes that the San Bernardo horse had a cough and the jockey requested medication from the veterinarian in charge who refused. However, after the 2016 palio, random checking of horses revealed a broncodilatatore substance (with properties similar to doping) in the blood of the San Bernardo horse. Some how that horse got some "cough medicine". In Italian, you can read about the revoking of the title here: Drogato il cavallo che ha vinto il Palio di Fossano. Another integral part of the palio are the fans (tifoserie) for each borgo. While the costumed courtesans of each borgo look stately and composed as they made their way to the palio, the fans let it all hang out. They marched through the streets to the castle chanting and shouting in coordinated fan (tifoso) clothing and face makeup. During the palio, the fans make noise and cheer on their borgo: they fill the air with colored smoke bombs and confetti, wave flags and banners, bang drums, chant, and stomp their feet. Some wonderful photos from the point of view of fans are shown here. In the linked photos, you can see the excitement of the night before the palio when fans are creating their props for the big day, their march to the palio, the cheering during the contests, the euphoria in the faces of the fans whose borgo is in the lead, and discouragement in the face of the others. 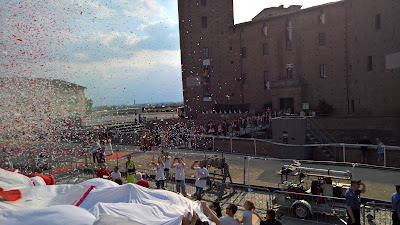 In particular, you can see the emotion of the fans of Borgo Vecchio when they learned they had won. The pride of the fans supporting their borgo and the good-naturedness of the competition is evident in the photos and we certainly felt it when we were there. It’s interesting to us that the long tradition of the Palio di Fossano carries on year to year with many young people behind it. After the palio, the castle area cleared out and everyone retreated to their borghi to celebrate. In Borgo San Bernardo, there was a dinner in the Parrocchia S. Bernardo. That day we were wearing blue (no particular reason) and there we sat in the after-palio dinner in a sea of red and white shirts. We survived, but note to readers: when attending a palio, read up on the appropriate colors for the team you’ll be supporting. 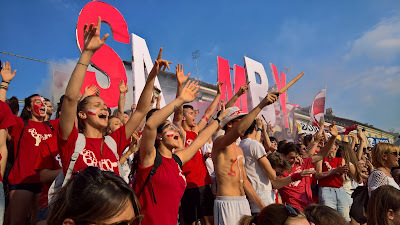 Left: Borgo San Bernardo fans cheering with SAMBY spelled out. Center: The Borgo San Bernardo entourage exits the castle and presents itself to the palio. Right: Start of a horse race. 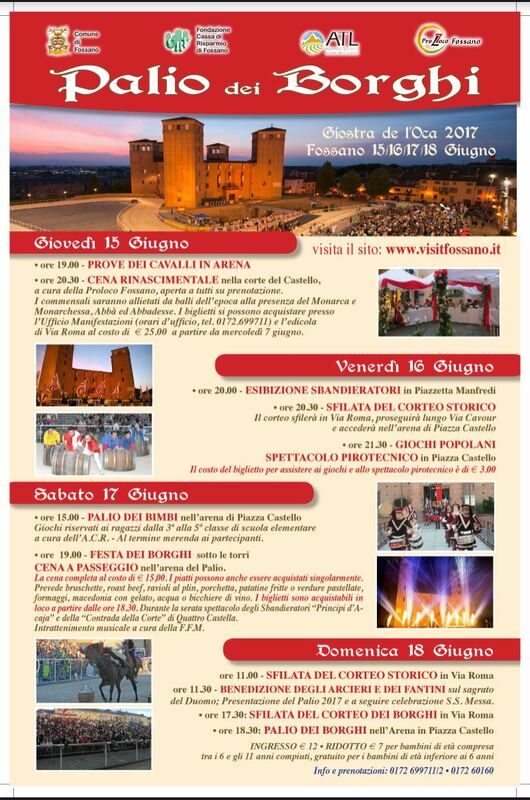 These are terms you might find useful if you are planning to experience the Palio di Fossano. A borgo is a neighborhood, district, or hamlet of a city. Other words that you might see to mean the same thing include rione/rioni, quartiere/quartieri, frazione/frazioni, contrada/contrade, paese/paesi, borgata/borgate. A tunic. The jockey’s wear tunics color-coordinated for the borgo they are riding for. The castle of Fossano, constructed between 1314 and 1332. “Acaja” refers to Principality of Archaea or Morea, the name of the Peloponnese peninsula during the Middle Ages. The word made its way into a title as an outcome of the fourth crusade, where it made it to Piedmont through marriage. The most historic part of a town in Italy, typically located near in the center of the modern town for towns not located near water. For towns located near water – be it a river, lake or ocean – the centro storico is usually closest to the water. 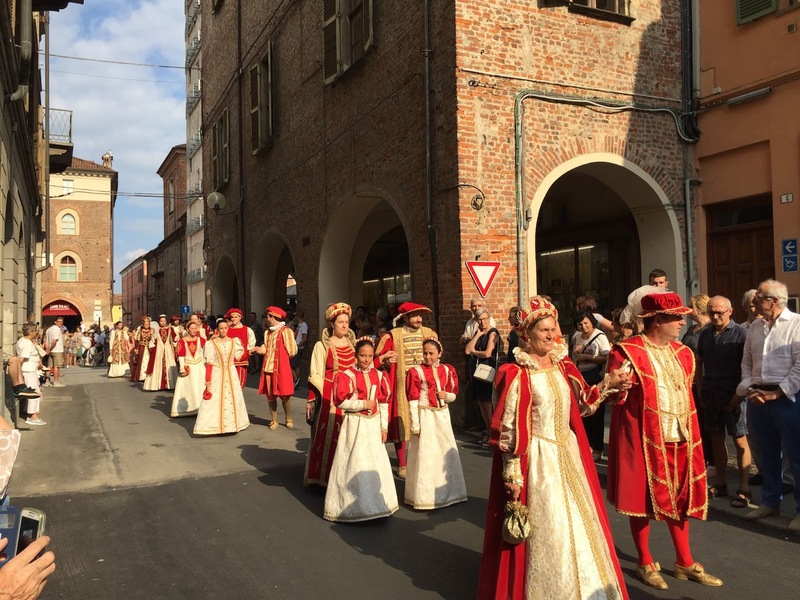 A parade or procession, usually leading to a festival or contest like a palio. A fantino is a jockey. The word fantino is a diminutive of fante, which means a foot soldier or a jack (card). In the historical sense of the word, it’s a battle between two horse riders, a joust. In the modern sense of the word, it’s an amusement park ride. A goose. Today’s Palio di Fossano features fake geese. At one time, they were live geese. A palio is and Italian word that broadly means tournament. The specifics of palios vary, but generally include participants from different borghi of a city wearing costumes in parades and competitions involving horses. The official title of the Palio di Fossano, it translates roughly as the palio of the neighborhoods and tournament of the goose. The collective group of fans or supporters of a team. Left: Red smoke from the Borgo San Bernardo fans. Center: Gruppo sbandieratori e musici principi d'Acaja di Fossano - flag throwers of Fossano. Right: Another borgo's court makes their way to the palio. We were rooting for Borgo San Bernardo. Left: San Bernardo musicians. 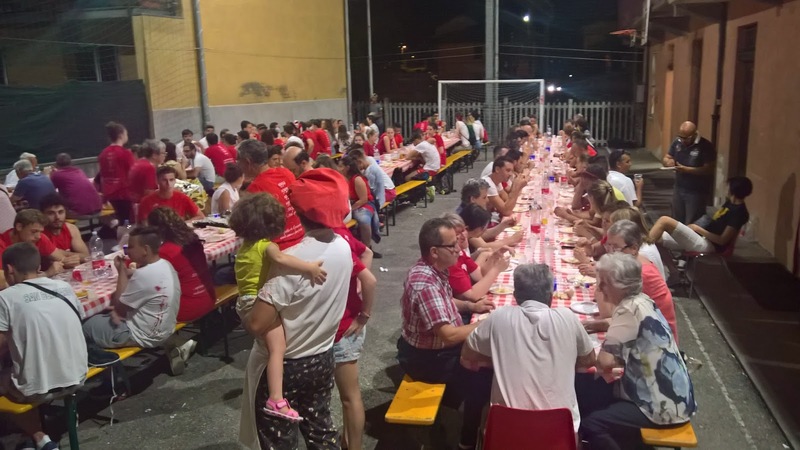 Center: Dinner in Borgo San Bernardo after the palio. 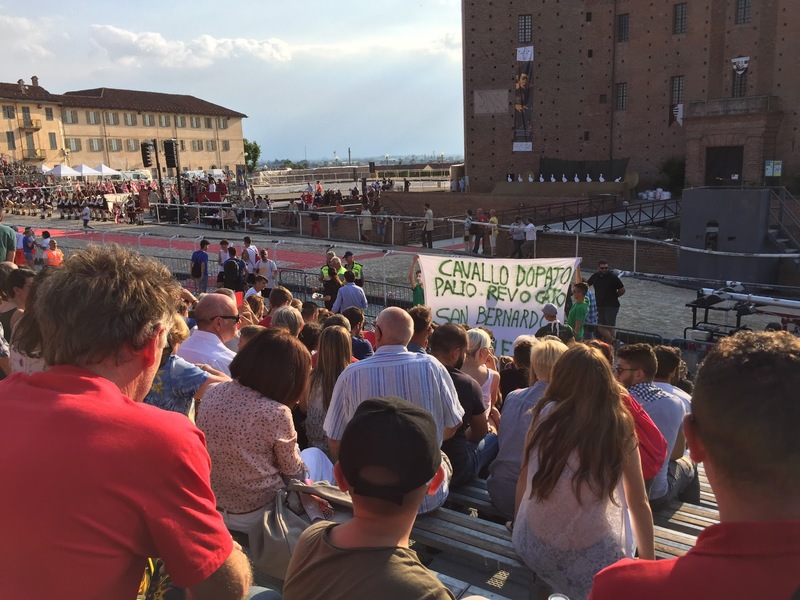 Right: During the palio, fans making fun of San Bernardo and the horse-doping incident. The sign starts of: "cavallo dopato palio revocato..."
Brochure of the Palio of Fossano.